I recently got to try out this super-rand om card game with a group of friends, and I’ve got to say, it’s surprisingly catchy. It’s marketed as a game for people who like cats and explosions, and . . . well, that may be accurate, but it’s more for people who like fast-paced games that combine elements of both chance and strategy–along with lots of weird goofiness. 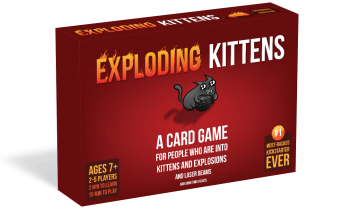 The game is basically an adapted version of Russian Roulette–everybody takes turns going around the table drawing cards until something explodes (you draw an “exploding kitten” card). But then, there are cards you can use to defuse this (basically putting it off until later in the game), as well as a number of other cards that have different effects on the game. (You can find out a lot more about the rules and such on the official website, https://explodingkittens.com/.) Like I said, the game’s catchy and involves a nice balance of chance and strategy–more or less depending on the group of players, obviously. It’s also pretty easy to learn, and each game goes quite fast. I do also have to note that the art on the cards is just plain strange; like, there’s all kinds of randomness on them that’s totally not necessary for playing the game, but it’s kind of interesting to read . . . also, slightly disturbing and very strange. But overall, I enjoyed Exploding Kittens and would generally recommend it. Ok, so this is totally not story related in the slightest, but my brother just recently introduced me to this absolutely adorable and slightly geeky card game that I’m just dying to share, so. . . . I should also note that this is not a full review; more like a first impressions post, since I’ve only played this a few times with the same group of people. But I think I’ve got the gist of the gameplay, and I can say with complete honesty that this game is a lot of fun. Sushi Go Party! 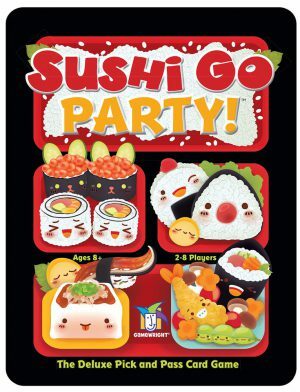 is a card game in which you are trying to assemble a group of cards (posing as adorable sushi and other edibles with super-cute faces) to get the highest number of points. Different combinations of cards yield different point values, and everyone’s competing against each other for the limited high-point combinations. The catch? You only get to play one card from your hand, then you pass your hand on and get the next person’s hand to play from instead! Sounds confusing, but it’s surprisingly easy to catch onto the rules once you get going. Much more difficult is actually amassing reasonable points, which involves a good bit of strategizing and adaptability. This is a game that would be great for teaching kids about statistics, probability, and strategy, but it’s also challenging enough to make adults have to think. There are a lot of choices as to which combinations you’re trying for, allowing for different difficulty levels as needed. Gameplay is pretty quick as well, making this a great party game. Theoretically, this is valid for 2-8 players, but I personally think it would work best with 5-6 (we played with 6, which was perfect). Oh, and have I mentioned that this is adorable?! The art style and the way the whole concept is framed as though you’re crafting a lunch with sushi, appetizers, desserts, etc. is just too utterly cute–and the style is very Japanese. Definitely recommended for those of you who like card/party games.